"Everyone who eats this popcorn just loves it. My kids, their friends, my friends, and family all expect this for an evening of movie watching. A delicious whole-grain snack!" Heat oil in a large saucepan or soup pot over medium-high heat. Add popcorn, and place the lid on the pan. Shake to coat kernels with oil. When the corn starts to pop, shake the pan constantly until the popping stops. Remove from heat, and pour popped corn into a large bowl. Drizzle the melted butter over the corn if using, and sprinkle with yeast, chili powder, cumin and salt. I like to give it a little stir before serving. See how to make old-fashioned restaurant-style hash browns. This was not as good as I expected it to be. 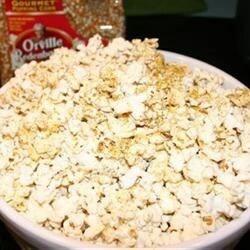 We make this popcorn with Butter, Nutritional Yeast, Season Salt & Parmesean. It's sooo tasty! I don't think I've ever had popcorn that's tasted better; drizzled with olive oil, then added topping. Mix well!